These inserts are for the Free- as well as the Pro- KIT OPS add-on. If need, you can find more information about the two versions of KIT OPS here: KIT OPS Kitbashing. 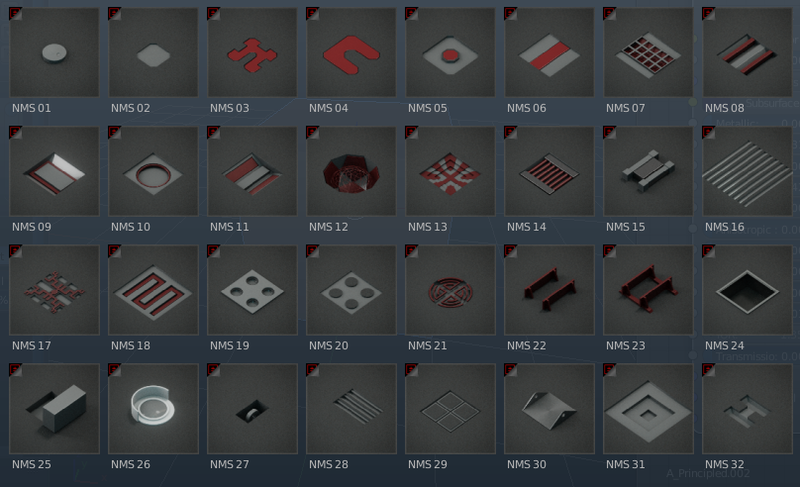 They look so simple and boring, but pretty sure you will use these the most. Don't worry about the flat look, it's easy to scale in Z (Depth). Next set has some variety like decoration, shelves, grids, windows, door, handles, etc. A few have shapekeys, and some have modifiers. Update 4 Januari 2019: In Blender 2.80 I noticed some orphan data messing up the insert. That has been cleaned up in NMS_insterts_v2.zip. So the inserts work now in 2.8 properly. Download the .zip file called: NMS_Inserts.zip. 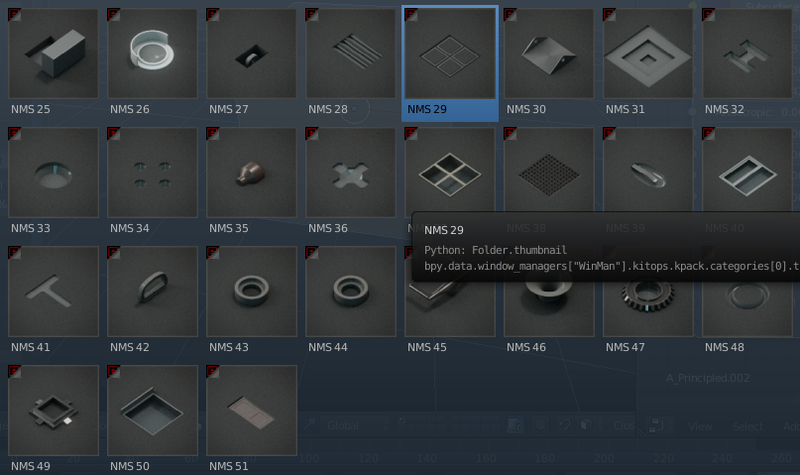 Unpack the .zip file and you see four folders: NMS_01, NMS_02, NMS_Cutters, NMS_Modifiers. Copy (or Move) these folders in a folder where KIT OPS is installed named: Master. Appdata is a hidden folder which you can turn on in the File Explorer in the menu under tab View > hidden items. Restart Blender and navigate to the KIT OPS addon. Under KPACKS in KIT OPS in Blender you will see the inserts. Add a bevel-modifier. Start with width: 0.015, Segments 4 or 5, Limit Method; Angle, Angle: 30 degrees. If you have a build with the Normal Weight Modifier, that does some magic sometimes. Right after using an insert (not yet applied), move the Boolean modifier before the bevel modifier. (Bevel modifier is always last). All you have to do now is: place insert > move modifier > place insert > move modifier etc. And request for new inserts are welcome.